Ingulegent yet healthy David Gillick's Rainbow Eggs are a tasty treat for the weekend. 1. Preheat the oven to 180°C/gas mark 4.
defrosts. Tip the spinach into a colander and press out the excess liquid. 3. Return the spinach to the pan with the crème fraîche and stir to coat. Season with the nutmeg and salt and pepper, then divide the mixture equally between 2 x 500ml shallow ovenproof baking dishes. 4. 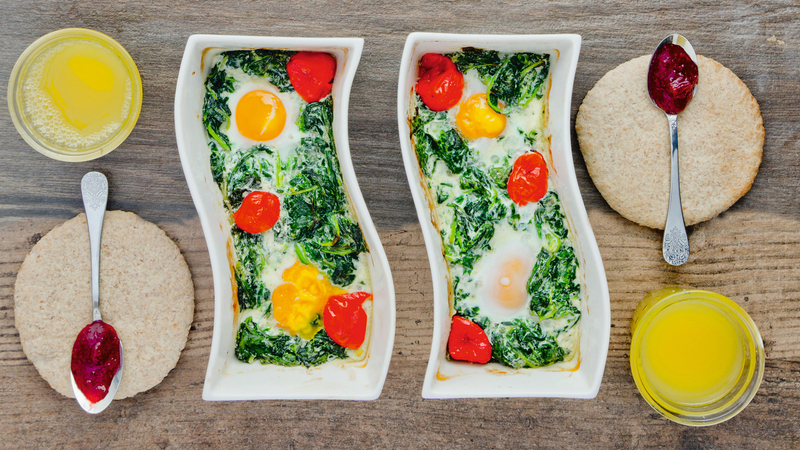 Make two hollows in the spinach mixture in each dish and crack in the eggs. Add three Peppadew peppers to each dish, then sprinkle over the Parmesan. 5. Bake in the oven for 10 to 12 minutes, until the eggs are just cooked. Serve with beetroot relish and toasted pittas on the side. Swap peppers for roasted tomatoes, sautéed mushrooms or even crunchy sunflower seeds.